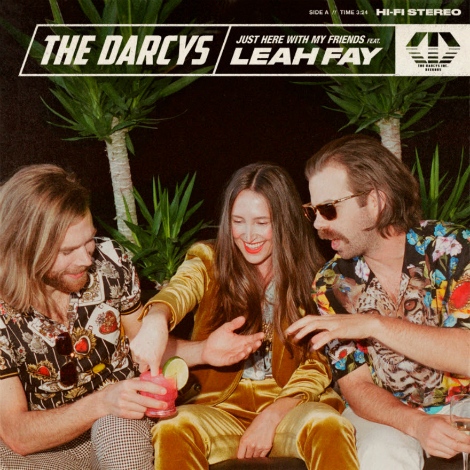 Toronto duo The Darcys collaborated with Leah Fay of July Talk to co-write “Just Here With My Friends”, an infectious single about two people who meet on a night out, feel a connection, but opt to prioritize a night with their friends, deciding to wait until the next day to see if it still feels right. The song is a perfect summer hit that simultaneously and intentionally challenges traditional pop music tropes. Pairing The Darcys’ signature vibrant synths and driving beat with the added collaborative firepower of Fay’s strong vocal performance, “Just Here With My Friends” becomes an exciting and playful back-and-forth that explores the initial attraction and interaction between two people. Dig a little deeper into the lyrics and listeners will discover that this song also has an important message.